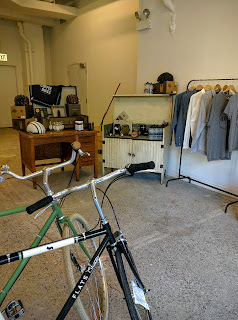 As we posted last week, Heritage Bikes has a pop-up shop on Wilson Avenue, right next to Heritage Outpost. It's only around through the end of September, but there's still time to party. Thursday evening, between 7pm and 10pm, come to 1319 West Wilson for Vienna Lager beer (created and poured by Union Beer Project). There will be Goldsprints (racing on stationary bikes) and prizes throughout the night. The Pop-Up Shop is only around throughout September, and is open between noon and 6pm Thursday through Sunday. So come by and welcome them to the neighborhood, even though they'll only be around for a limited time. This is a nice pr stunt, but we need real businesses in Uptown, not "pop up shops". You can't tell me there isn't someone out there that could take a crack @ running a real, sustainable business in the space? Every time I walk that block I'm blown away by the shear number of pedestrians. I hear J Michael is waiting for a classy joint for the former Fontana. WTF does that mean and when is it happening? Fontana's food was mediocre at best, but they were always busy. A place like Rockwells over in Ravenswood Gardens would thrive in that spot. What are folks waiting for?